Sarah Chinn received her Ph.D in English and Comparative Literature from Columbia University in 1996. She is currently Chair of the English Department. Her work primarily explores questions of race, sexuality, and gender in U.S. literature and culture, particularly in the 19th century. She teaches a wide range of courses from Nineteenth Century Women Writers to Early American Drama to Literary Theory to Multicultural American Literature. 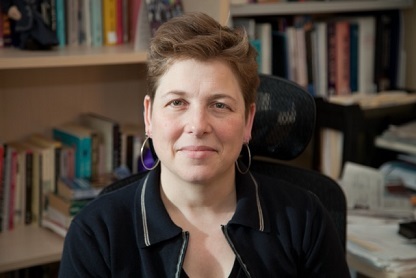 She is the author of Technology and the Logic of American Racism: A Cultural History of the Body as Evidence (Continuum, 2000) and The Invention of Modern Adolescence: Children of Immigrants in Turn-of-the-Century America (Rutgers University Press, 2009). Her most recent book, Spectacular Men: Race, Gender, and Nation on the Early American Stage, 1780-1830, is in production at Oxford University Press. For details about Prof. Chinn's publications and other scholarly work, you can go to her page on the CUNY Commons. This semester, Fall 2016, Prof. Chinn is teaching English 494, Lesbian and Gay Narrative after 1945.